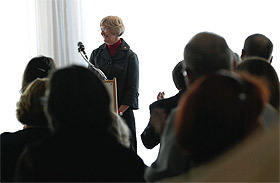 At the recent Honors convocation, the Center for Teaching and Learning and the Office of the Dean recognized the 2010 recipients of awards for Distinguished Contributions to Teaching and Learning. 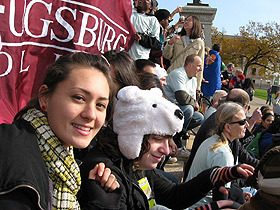 Tayo Johnson, a student in the Integrated Term, “Fate of the Earth 101,” with other Augsburg students at the State Capitol, during the 350 Day of Action. What happens when you combine 50 first-year students, five professors, a gigantic problem, and no traditional grades? In the case of Augsburg’s Integrated Term, you get a pretty interesting story. Here’s a quick primer on the iTerm. 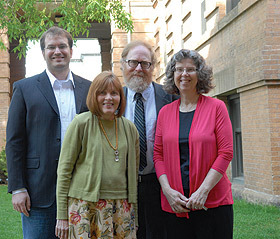 At last week’s faculty luncheon, Augsburg professors took a break from grading exams and final papers to mark anniversaries and celebrate their accomplishments.